Happy belated father’s day to all you “fathers” out there and also happy first day of summer! Yesterday being father’s day gave me the opportunity to do something that I love to do and not feel guilty that I wasn’t at home working on one of the many projects/chores are on my Honey-d0-list. I was suppose to have spent the day with one or more of my daughters and grand children, but due to last minute changes in plans and also rainy weather, they didn’t make the journey to the coast. They all called and wished me a happy fathers day, we chatted, I went out for sushi with my wife, then came home in the rain. The sun came out mid afternoon and I was feeling the “call”, so I decided to go a wandering to check out some of my favorite shrooming sites. 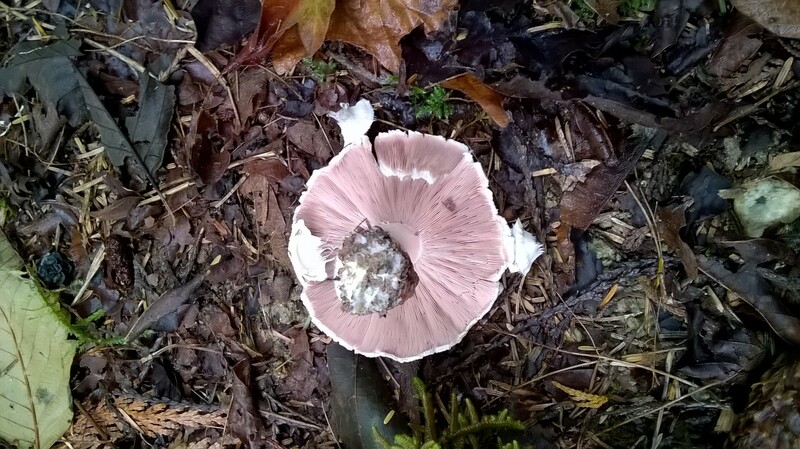 I don’t know if I am imagining things or I am actually getting better at this foraging thing, but when I visited a couple of my more productive sites….I swear I got a very slight whiff of pine mushrooms!! 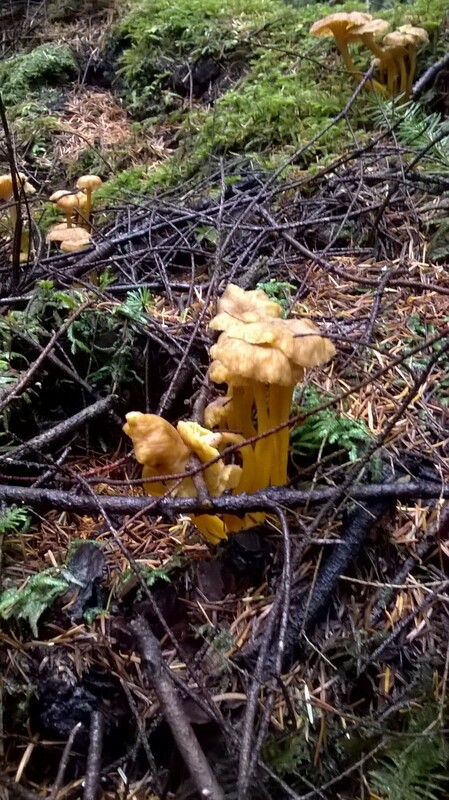 I also visited one of my chanterelle sites and got a different, but distinctly chanterelle-ish scent…..oh how the mind plays tricks on one….or maybe it’s the inner canine coming out in me. I do have to say that I was very pleased to see how damp and succulent looking the forest floor was. I haven’t seen it looking like this in more than two years. I hope that this abundance of rain we have had over the last couple of weeks is doing it’s magic and awakening those sleeping mycelium. I also discovered a new trail that looks very promising and plan to go explore it once the mushrooming season is in full swing. What did I find yesterday? 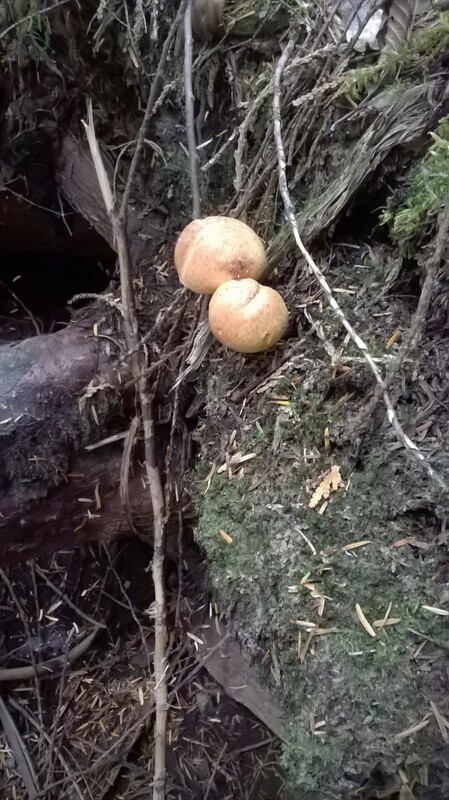 You may not believe it, but I found two beautiful examples of boletus edulis…AKA porcini; king bolete, cep and steinpilz. But alas as you can see….they were mostly consumed by the local wildlife..
You can see this slimy devil sliding away from what looks like some wasabi peas…which where right next to the porcini. I hope the wasabi peas gave it a bit of a “hot foot”. Duane Sept’s book Common Mushrooms of the Northwest does say that the season for porcini runs from June through October. I have not found them this early before, but maybe some of you have? It may be the cool rainy weather we have had the last couple of weeks that is fooling the fungi into thinking it is the fall…lets get out there and see what else is flushing. 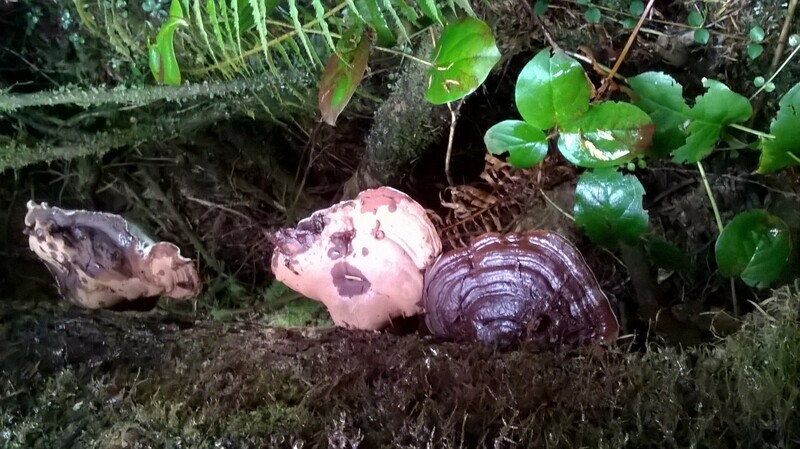 Just to let you know, these two specimens were right at the edge of the trail and I am always amazed that someone didn’t recognize them earlier for the prize they are. On the way back I was letting my eyes go “soft” just scanning the forest and shlack.…there to my left was a beautiful oyster flush on a standing dead alder. By the way…”shlack” is one of those generic words used to denote a magical/unexpected appearance of something which is regularly used by an Irish friend of mine. I like it. I also saw some young dyers…velvet foots… which I will g.o back for later this week and collect them for the Fungi and Fiber Symposium this coming fall. 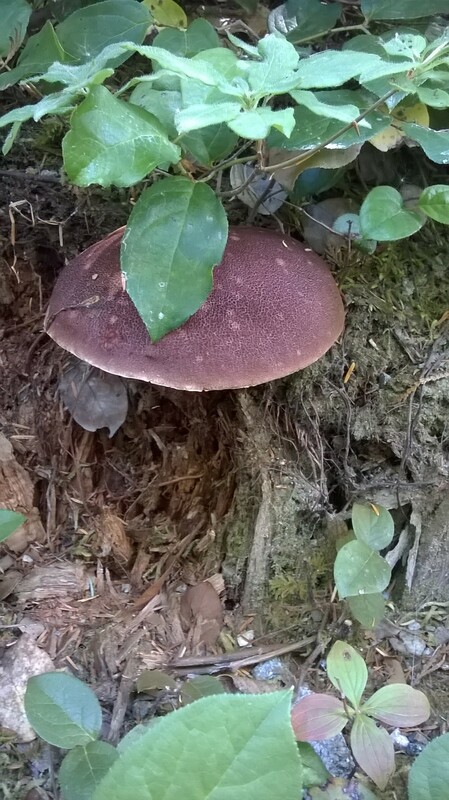 Not a bad day at all….found a potentially good new foraging sight; inhaled the beautiful aromas of the deep green forests; found some early porcinis and also a lovely flush of oyster mushrooms….. all in all a great Sunday-father’s day ramble in the woods and on the pages. Looks like it’s time to organize some club forays as the season may be starting early this year. 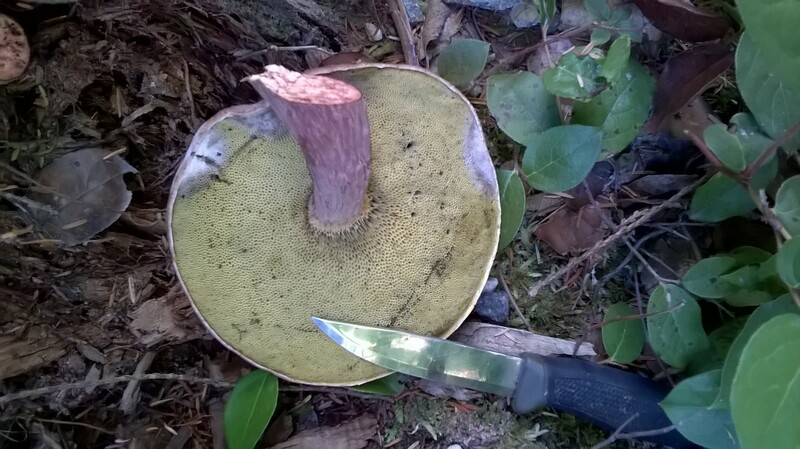 Hope to see you on the trails someday…happy hunting..coatalshroomer. Happy spring to all you wild foragers out there! The weather is starting to improve, the trees are starting to bud, there are some early blossoms on those hardier shrubs, the hummingbirds have returned as well as the spring-time bird song. That means that spring time mushrooms should follow. I have been out all winter, searching for what is out there and I have always found something. This spring, many mycophyles here on the coast are very excited over the possibility of having a bumper crop of morels. The reason being that there was a very large forest fire in West Sechelt last summer, so the anticipation is that there is a good likelihood of fire morels popping up this spring. The burn site was closed after the fire was extinguished because of the danger of trees damaged by the fire coming down. There were and still are signs in the area warning people to stay out due to falling debris. This winter we had some tremendous wind storms which took out a number of trees weakened by last years drought so I figure any trees still standing after the fire and the winds should be safe. Sunday I decided to do an exploratory foray into the fire zone to see what I could see. There was very little under-story to the forest and most trees were burned about 1/2 to 2/3rds the way up their trunks, but most had greenery at the canopy level. There were some areas that had more ash, but I was looking for the red leaf area of the burn. This is the area at the edges of the fire and where the fire rushed through, burning the fuel on the forest floor but not really burning the standing trees. It was hot enough to stress the trees so they lost their needles. 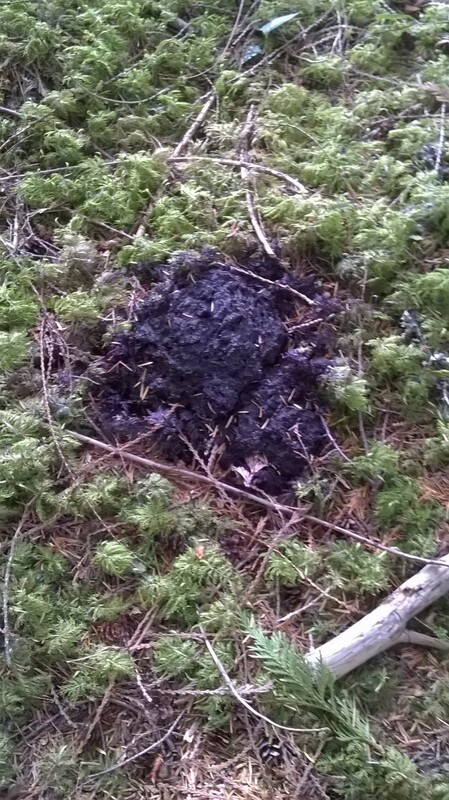 This area is what I understand is the prime area to find fire morels. I got that information from our guest at last years Mushroom Festival, Langdon Cook. I found an area that looked promising and did a bit of scouting. There were mushrooms there, not morels, but other ascomycetes growing in the duff. 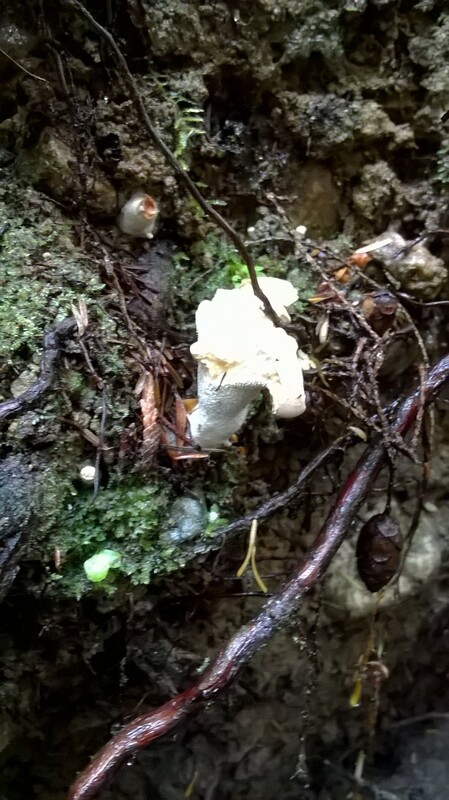 In the top two pictures you can see some very small cup or sac fungi, as well as some jelly fungi. 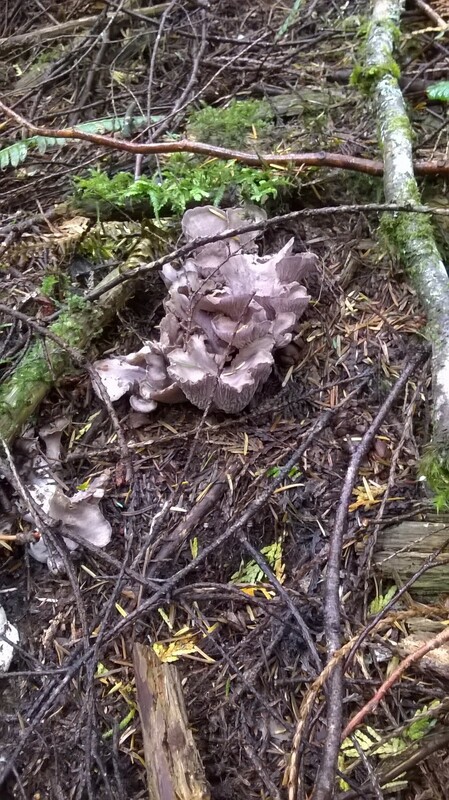 The bottom picture has a nice example of gyromitra ancillis, as well a couple of little brown-gilled mushrooms. I haven’t IDed them yet, and from a distance they look bit like winter chanterelles, but they are not, as they are gilled. I would say that this is a good sign, as morels are also ascomycetes, so hopefully they will be arriving soon. There are over 30,000+ species of ascomycetes, ranging from one-celled yeasts to fairly large morels and truffels as well as some of the common black molds, green molds, the powdery mildews, the cup fungi. Although most are considered in a positive light for their ability to ferment some of our favorite beverages, to leaven our bread and to add a distinctive ping to some cheeses, other are more notorioius as disease promoting organisms ( chestnut blight, Dutch Elm disease, forming rots of a number of fruit trees, powdery mildews). I plan to check this site fairly regularly over the next several weeks in the hope of finding one of the culinary world’s favorite mushrooms. I will let you all know how I fair out there. Hope to see you on the trails sometimes. Was that the last foray for 2015? 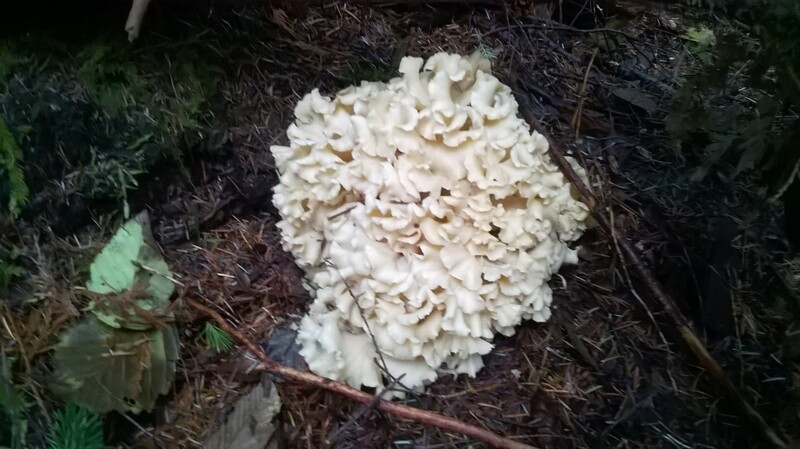 Last Sunday, myself and 18 other enthusiastic shroomers, hiked up into the mountains above Pender Harbour and had a great afternoon tromping through the woods. It was a cold and clear day and the views from the ridge we were on were breath taking. There was a great view down into Pender Harbour and Barry, our foray leader, pointed out his house to us. When we got the area that Barry had scoped out, we found a tree blocking the road. Barry got out of his truck and grabbed his chainsaw out. In minutes, with the help of the rest of us, we bucked up the tree and cleared the road. Note to self…pack a chain saw with you when you are heading up into the back country. Never know when you have to clear the road. Many years ago, when I was living in the City, a neighbour of mine took that one step further. He was an older guy, much into fishing and hunting, and taking pack horses into the back country on the Alberta-BC boarder. He told me that he and a friend had a favourite valley in the Fernie area where they hunted for Elk and deer every year. There was only one old logging road into this valley, and each year he and his friend would go there to hunt. In order to keep the elk population in good shape and so that other hunters wouldn’t find their private “Shangrila”, they dynamited the road to keep others out. I know that many shroomers are very secretive about their “patches” and will go to extreme lengths to keep their favorite spots protected. However, dynamiting the roads to keep it safe….that I have not heard of yet. I come by my passion for mushrooms and being in “the bush” from my father Tony. My ethnic background is Ukrainian, and being the son of an eastern European, mushrooms were always on the menu. As much as my father was passionate about mushrooms, my mother was just the opposite. There would often be a “discussion” about where my father was off too, especially when she found him pulling on his rubber boots and putting his mushrooming buckets into the truck. It frustrated my mother to no end when my father would arrive home with a pail or two filled with mushrooms. My dad picked and he cleaned the mushrooms but it was my mother who cooked and canned them. She never froze them, only canned them. As for cooking, she did it the way most Russian or Ukrainians did…boil them for at least an hour, drain, and then make a “much-ka” as she called it, then add the mushrooms to it. Much-ka ( my spelling) was the universal sauce used in our house. It was a basic cream sauce made by frying onions and garlic in butter or margarine ( that’s when butter was bad for you and margarine healthy), followed by fresh full fat cream from the farm, salt and pepper. That was it. You would then add your prepared mushrooms and heat through and serve on perogies, home made noodles (macaroni to my dad), new potatoes, chicken, pork-chops or just a slice of rye bread. Sometimes my mom would add dill to the sauce, particularly with new potatoes or her young chicken stew. Just recently I asked my 88+ year old mother how she actually canned her mushrooms. Her response was to clean then boil in salted water for 1 hour, pack into pint jars then process in boiling water for 2 hours. After they were cooled, store in the fridge or cool place, like the root cellar. I said “2 hour?”.. she said you cook them an hour to get rid of the possibility of poison, then process for 2 hours as an added insurance. When I told her I just lightly saute them in butter, she was quite shocked. I have to say that even with the cooking for lengthy periods and canning, the mushrooms still had good flavour and texture. I know that my dad picked morels in the spring, birch boletes in the summer and another mushroom as well that I have yet to identify. He called them “cows mouths” or “karovchi-peski” ( my spelling of the Ukrainian vernacular). 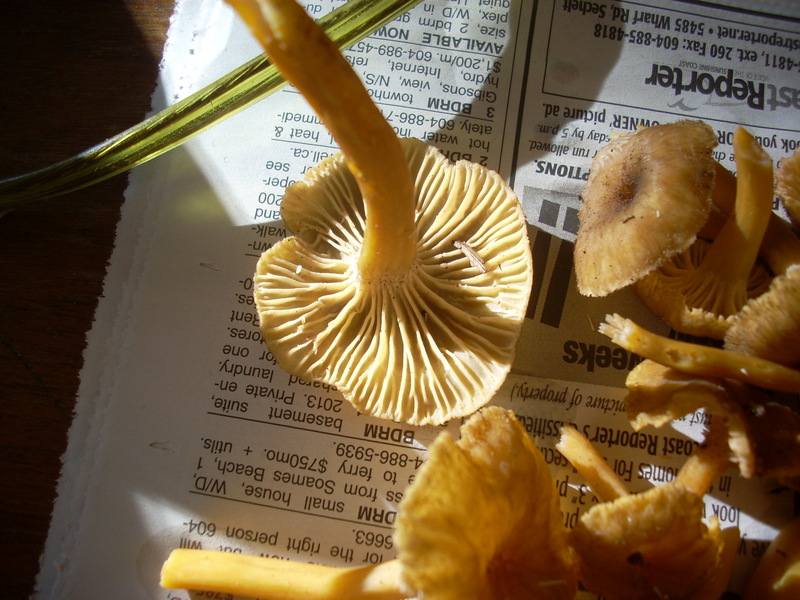 They were a light tan to gold in colour; short stemmed; light coloured gills;somewhat funnel shaped cap with the edges curled under; when you cut the flesh it turned an orange colour and was firm. 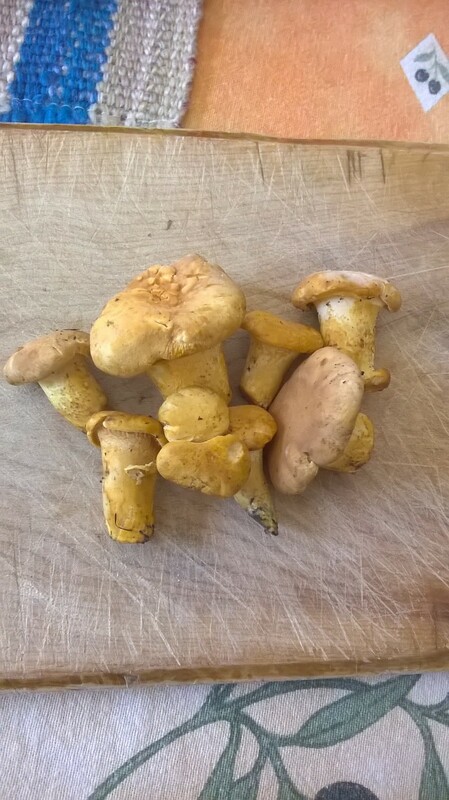 Sometimes we called them chanterelles, but it was more than 45 years ago that I picked them, so my memory may be wrong about if they had gills or folds at the time. They were my favorite. 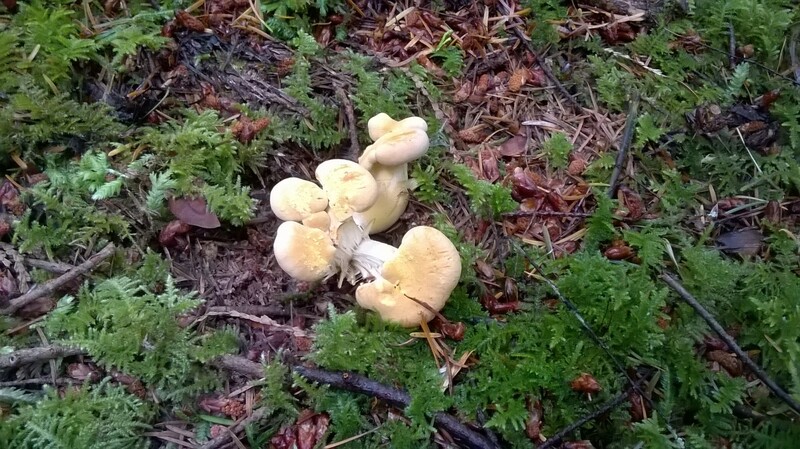 In the fall my dad picked peidpenki – or honey mushrooms. Now I now know that these mushrooms should be boiled for 5 minutes then fried, as if you don’t do this, some people have gastric upset. If you dry the honey mushrooms, you just have to re-hydrate and cook. The drying seems to have the same effect as parboiling them when fresh. My dad also picked another species of mushroom after I left home, which he called “pitch-chi-ritchie. I don’t know what they looked like or what they tasted like, as I never got to see or taste them. I asked my father why he liked picking mushrooms so much. His response was this….” I love being in the bush…it reminds me what it was like in the Ukraine as a boy….also the mushrooms are free … nothing tastes better than something that you get for free”. What use to really get my mother going was that his favorite day for foraging was Sunday. My mother was very religious and was always insisting that my dad drive us all to church on Sundays. My dad was not a “church” kind of man, he believed in God, but disliked the organized church,and especially the priests…”blood suckers” as he called them. He would say to my mother ” my church is in the bush…I feel close to God when I am in the woods” …..then off he would go with his boots and his pail, singing merrily as he went. My dad had a wish…that wish was that if he could choose the time and the place where he would died, he wished he could die while in the woods, hunting for mushrooms. 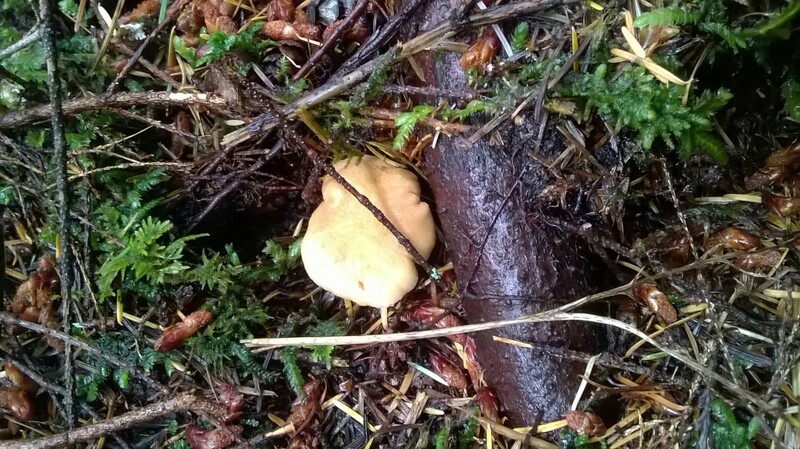 One day his friend fellow forager,had gone out mushrooming but failed to return when he said he would. His family and friends being concerned , went out to look for him. They found him, sitting on the ground, leaning against a tree. He had passed away. From the look on his face,peacefully. Beside him was his picking pale, full of mushrooms. All around him in the grass, were hundreds more. That was how my dad wished to go. Unfortunately that didn’t happen as he died one very cold February day, in the hospital, after a very short illness. This fall I went to Saskatchewan to visit my mom. One of my families traditions, is to visit the graves of close family. So one day we did that and visited my father’s grave as well as several uncles, aunts and grandparents. All the graves sites were well maintained and the grass cut. However, right over my father’s grave, there were mushrooms growing. No where else in the whole grave yard were there mushrooms growing…only over my father’s grave. I smiled and I thought… how appropriate…my dad was an avid shroomer…he loved being out in the wild, foraging for mushrooms…he even hoped that when he had to leave this world he would do it while on a foray. That never happened, but he still rests where mushrooms keep him company. I shouted ” I found a cauliflower” and everyone came running. A few thought I joking, but no, in fact there she was…beautiful and fresh, with no elk nibbles. I gave everyone a piece to take home and try, and I still had a couple of pounds left. Everyone was able to pick large numbers of them. This is the kind of weather that winter chanterelles really like. As for other varieties…there were a few late oyster mushrooms and when they start to show up you know the season is about done. So, there you have it, time to put away the basket, clean the harvesting knife and dry the last batch of winter chanterelles. It was not a bad year, not a great year, but an average year. 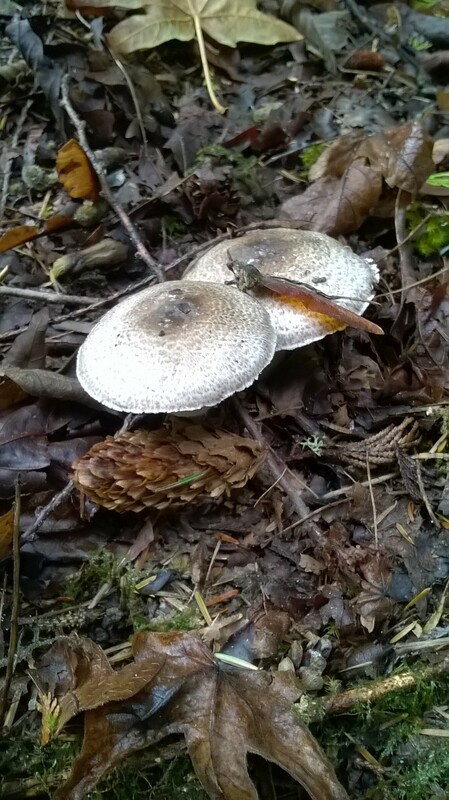 There were lots of pine mushrooms this year, in places I had never seen them before. And of course there is now the anticipation of what we may find in the burn site in West Sechelt. Visions of morels dancing in our heads. Hope to see you sometimes on the trails and maybe in the burn site next spring. What a great festival we had this year!!! I always find that there is something new to learn as well as meeting new and old friends at the festival. It never ceases to amaze me that there is such interest in mushrooms in the general population, especially for that fact of the myco-phobia that is so prevalent in western culture. Actually you can’t be poisoned by just touching a mushroom…you have to ingest the mushroom…eat it and usually a bit more than a mere taste. I was quite surprised on one of my first forays with one of the mushroom “gurus”, Larry Evans, while identifying the mushrooms, took a bite out of a mushroom. He explained that one of the ways to properly ID certain Russulas, is to taste it…I said “But what if it is poisonous?”…he said, “you taste to see if it is peppery but you spit after the taste and don’t swallow”. Out here on the west coast there is only one plant, not a mushroom, that is poisonous to touch…That plant is the water Hemlock. many of you, I think from personal experience, already know that some plants have developed protective chemicals to ward off pest, a good example being stinging nettle. As for colour being an indicator of virulence…there may be some truth to that, such as the beautiful Amanita Muscaria, but many of the most poisonous have very little colour, such as the Smith’s Amanita (Amanita smithiana) which is pure white, and is often mistaken for the white matsutaki. If consumed, this mushroom can cause kidney failure. 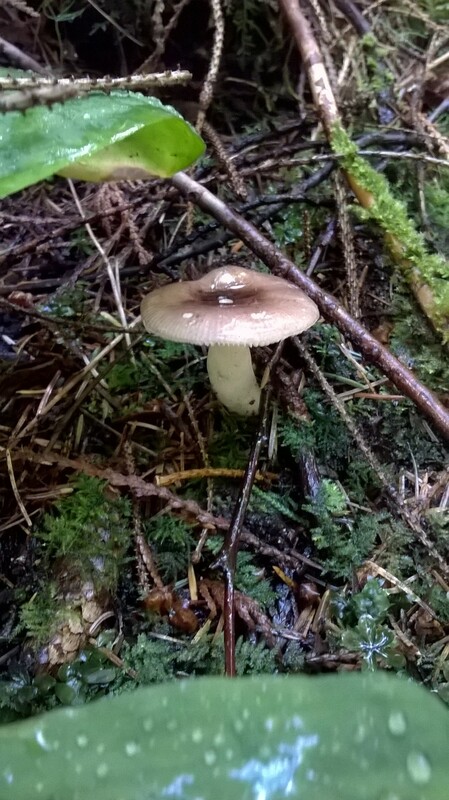 There is also the fairly bland coloured Death Cap, ( Amanita phalloides) where a single specimen can kill a human being, and 90% of all fatal mushroom poisoning incidents in Europe have been attributed to this mushroom. A similar species, the Destroying Angel ( Amanita virosa) is an all-white species that is common in the Pacific North West. Emperor Claudius, who ruled Rome 2000 years ago, was the earliest known victim of this species’ poison. Enough about mushrooms that can poison you, I want to talk about those that are edible and choice. This year at the festival we once again had the public foray and cook-up on the last day of the festival. Even though this year started slow and picking wasn’t always at it’s best, we still had enough variety for our display tables and for the food table. I think that our “cook-up” this year was the best so far, and from the reviews of those that went on the foray and then sampled the dishes prepared, it was a great success. Many thanks to all the “cooks” and “cooks’ helpers” for making the event such a success. Also many thanks to all the members that donated their edibles to the cooks to allow them to prepare the great dishes that were prepared. Many have asked for the recipes for the dishes prepared so rather than drone on, I will post them here. As a final note, I want to thank Ginette Carter, Michan Padovani, Nicole Rossi, Dorothy Gonzalez and Dave Beauchesne for their recipes and their delicious dishes they prepared. I too was one of the cooks at the event. Follow your favourite way of making the crepes. I have a Crepe Grill. I love it! Spring: soak 50g of dried morels in warm water for about 30 min. Strain, filter liquid and reserve. Take each morel and rinse it through the aperture to remove any potential grit or dirt lodged inside the morels. Shake each, to remove excess water or use a salad spinner. Slice in 1/4 to 1/2 inch across the morels to produce pretty little pin wheels. Stand aside. Sautéing chanterelles: in warm large frying pan, in olive oil and a nut of butter add rehydrate winter chanterelles or fresh ones, Sauter until liquids are removed. Add add shallots and a dash of thyme. Salt and pepper. Then add a splash of white wine, reduce again, reserve. Fall: add other types, whatever you just harvested. For porcini on the Coast….. Sauté in thicker slabs quite hot, season then chop and quickly sauter again (they can be easily oiled and broiled, the. Choped). Caution: Fresh porcini can get quite soggy if not sautéed hot, or broiled with seasonning, the chopped. Winter: 2-3 cups of winter chanterelles fresh. If you can, add 250ml of dried winter chanterelles for texture, colour and deeper taste. (rehydration process like for morels). Keep saved liquids, reduce them to add a mushroom jus, and depth to mushrooms during sautéing. Sautez each mushroom batch in 1 tbsp of olive oil, and a dot of butter. Add 1/4 to 1/3 cup shallot, a portion of a garlic clove. Season,. Reserve each. Thinly paint the slightly toasted pizza crusts with Alfredo sauce (4 cups). Decorate each quarter with its sautéed seasonal mushroom, sprinkle a little bit of mozzarella over the whole (less than 1/4 cup mozzarella per pizza,… less is best). Salt and pepper. Drizzle Virgine Olive oil. Heat pizzas just long enough (on Bbq pan or in oven) , to melt cheese. In a large skillet, cook the garlic, onion and oil to slightly tender. Toss in the matsutake and on medium high heat, cook till they start to get brown on the edges and the water is mostly gone in the pan. Add the broccoli, and toss with the soya sauce, almonds and sake. Cook till the broccoli are just turning a darker green and still crunchy – add the Mirin and S&B, fry and toss another 30 seconds – ( the Mirin is a slightly sweet Japanese condiment and the sugar in it will burn if added too soon ) . Buy Polenta with porcini in a packet from an Italian store. This is “Instant” polenta that takes 4-5 min to cook when you add it to boiling water with a little olive oil or butter in it, stirring constantly until it thickens up. Add fresh grated parmesan at the end just before serving. Pine mushrooms are really difficult to cook I find, as they can sometimes be very tough, especially the stems. This recipe was inspired by discussions with Langdon Cook who was the guest speaker at the 2015 shroom festival. Pine mushrooms – 2 or three medium sized, cleaned and sliced very thinly, not more than 1/8 of an inch thick. Put the sliced pine mushrooms in a bowl and mix all the other ingredients together then pour over the mushrooms. Reserve a ¼ cup of the marinade for later. Let marinate for 1 to 2 hours. Heat a barbeque up and then grill the pine mushrooms until they start to get a nice grill marks. Serve with plain white steamed rice using some of the marinade saved earlier as a dipping sauce. This is a basic recipe that can be adapted to use with whatever mushrooms you have on hand, and if all you have are some commercial button mushrooms, they will work too. 1-2 pounds of mushrooms cleaned and chopped : they can be all one kind or a mixture of any of the following -golden chanterelles, honey mushrooms, winter chanterelles, porcini, shaggy parasols, cauliflower mushrooms. I don’t use pines, as they tend to overpower the other flavours, but is you have an abundance of pines, use just them. Add onions and whole garlic and start to sauté until they begin to brown. Add paprika -1/2 tsp salt and ½ tsp cracked black pepper. Add chopped mushrooms and sauté 5 minutes then add in the potatoes and thyme cooking for another 5 minutes . Now add the chicken soup, the water and either the wine or lemon juice at this time. Bring to a boil then turn down and simmer for 15 to 20 minutes. I now use an immersion blender to liquefy the soup, but if you don’t have one you can use either a regular blender or food processor to do the same. Taste and adjust seasoning adding more salt or pepper. One optional step here is if you want a richer soup, you can add a half pint of heavy cream. You have two choices when making these dumplings….you can either make your own dough or use wonton wrappers. If you want to make your own dough, they more resemble pot stickers or perogies. If you chose the wonton wrappers they are more like a tortellini. Dumpling Dough: This is my perogie dough and is the best I have been able to find. It can be scaled up or down for more or less dumplings. The ratio is always 2 parts flour to 1 part hot water. You can also fill this dough with traditional filling like potatoes and cheese; sauerkraut; fruit etc. For about 100 small or 50 medium sized dumplings. Put flour, salt and oil in a bowl then measure out the boiled water and pour over the ingredients in the bowl. Mix with a wooden spoon and as it comes together start to knead it. I will be a bit hot to touch but cools down quickly. If it is sticky while you working the dough, dust with flower but you shouldn’t need too much. Knead the dough until it is nice and elastic, about 5 minutes. Then put it back in the clean bowl, rub with a bit of oil and cover with cling wrap and let it rest while you prepare filling. Chop mushrooms finely and add to cold pan and turn on medium heat. Slowly dry fry the mushrooms until most of the water has evaporated and they star to stick to the pan. Remove and set aside. Add oil to pan and then onions. Cook the onions until they just start to brown, then add the sausage meat, breaking it up with a fork. Cook until starting to brown and render out the fat. Drain the fat from the pan and the return 1 tablespoon, and the reserved mushrooms and ground fennel. Cook another 5 minutes until everything is fragrant and well browned. Drain again and place mixture on a dinner plate spread out to cool. Once cooled, divide the dough into 3 or 4 pieces and roll one at a time to about 1/8th of an inch thick. Using a cookie or biscuit cutter, about 1 ½ to 2 inches in diameter, cut out rounds. Pick up a round and add some of the cooled filling, bending up the sides to form a pocket, pinching the edge shut. Once sealed, place on a tea towel and continue until all the rounds are used. Take the cut off pieces of dough and set aside until you have rolled out all the dough. Combine all the cut offs into a ball as this will become your “second” rolls which will be a bit tougher than your first roll outs. They may need a little longer cooking time. If using wonton wrappers, do the same thing, only use either a bit of water or one beaten egg to seal the edges together. Bring a large pan of water to the boil and add the dumplings, about a dozen at a time. Once they rise to the top, lower the heat a bit and boil 3-4 minutes, stirring with a slotted spoon. Take one out and test for doneness. I they need another minute or two, let them cook. Remove with a slotted spoon to a warm bowl and toss with a bit of olive oil. Serve them like they are with S&P or in a nice broth or brodo as the Italians call it. The dumplings can also be frozen uncooked on a cookie sheet then stored in a zip-lock bag in the freezer. When you want to cook them, go right from the freezer to the boiling water. These last three recipes are mine. I hope you enjoy some of these. 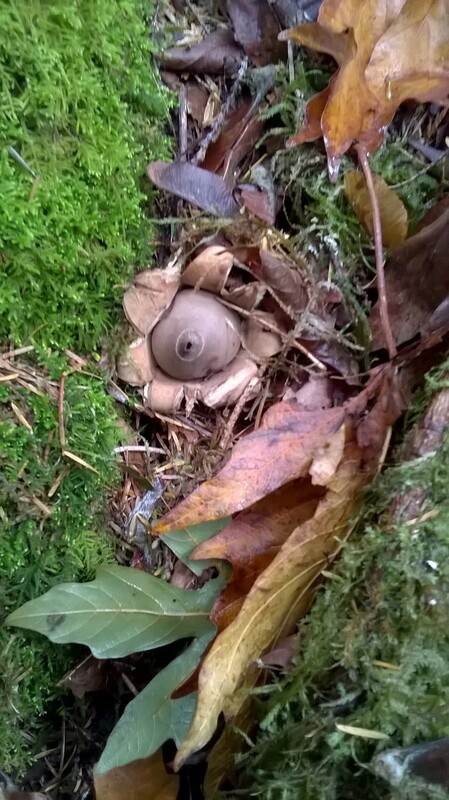 I decided to take a walk in the woods yesterday, to see what the forest floor was doing. I was not overly optimistic, but a few of my fellow mycophiles have reported sightings both in woods and in one of the local grocery stores. 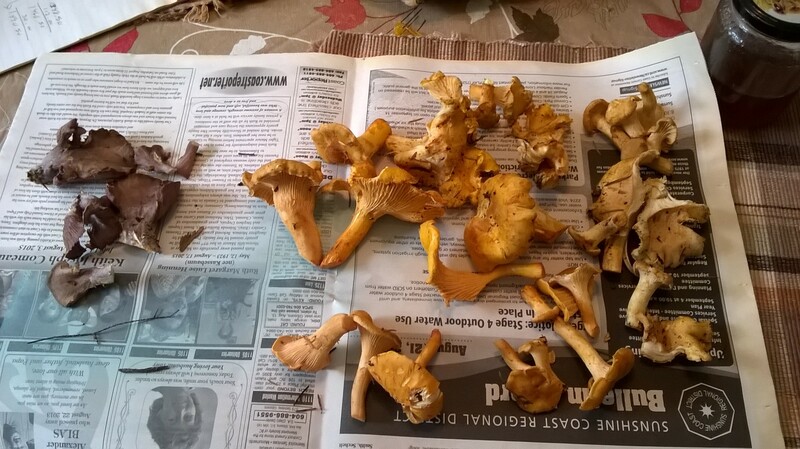 The sightings in the woods were of Chanterelles and a few boletes. In one of our local grocery stores, Claytons, one of my friends called and texted me about local Pine mushrooms for sale. I said “what?” seems awfully early for pine’s (masutaki’s) as they usually come later in the fall, usually between October to December. I said they must be coming from somewhere off the coast or further north where there has been some rain. M friend checked with the produce manager and she informed her that yes they were in fact local. Sounded interesting and promising so that is what prompted me to head up Dakota Ridge way to check out a couple of areas where I have found pines before. I have to say, I am convinced that those pines must have come from some other area of the coast. The reason is the extreme dryness in the woods…the moss is bone dry and even dusty, it sounds like you are walking on rice krispies. However, I did have a couple of sightings that did sunrise me. 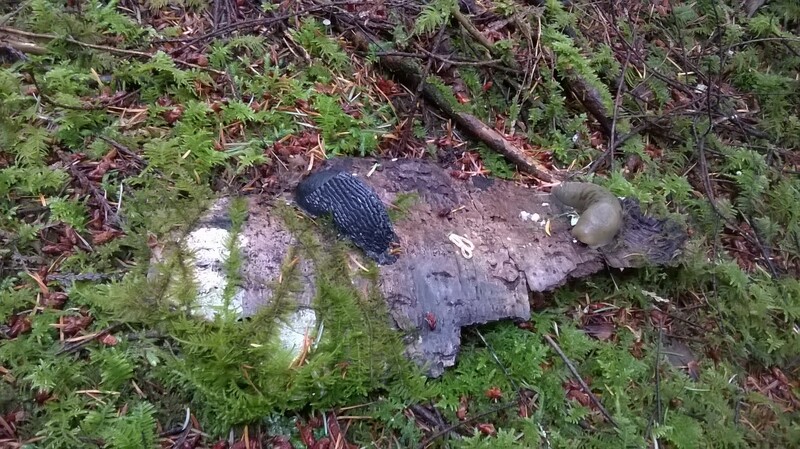 On one old stump right beside the road I found two species. The second picture shows it size and the under side and the porous sponge. When I sliced into the cap it was full of worms….sigh…too bad. This beautiful example was growing on a stump and being obviously a good substrate, I decide to check the other side. Sure enough there was a couple of very nice examples of Wooly Pine spikes (Chroogomphus tomentosus. one of the two look-a-likes of the much sought after Chanterelles. Well, we now have proof!! But I wondered “What the hell is there to eat here in the woods? I saw no berries, very little vegetation, and I was two thirds of the way up to the top of Dakota Ridge? Finally on my way down I stopped at one other spot that I always have success at, but usually much later in the season. Again…very dry, dusty and crunchy….but I did find a very young Califlower Mushroom (Sparassis crispa) …and very appropriately named as it it was very dry and struggling. Also the picture it’s self is less than crisp….my shutter speed was off a bit me thinks…so much for auto-pilot. So there you have it, IMHOP, still need lots of rain but the fungi world is trying. 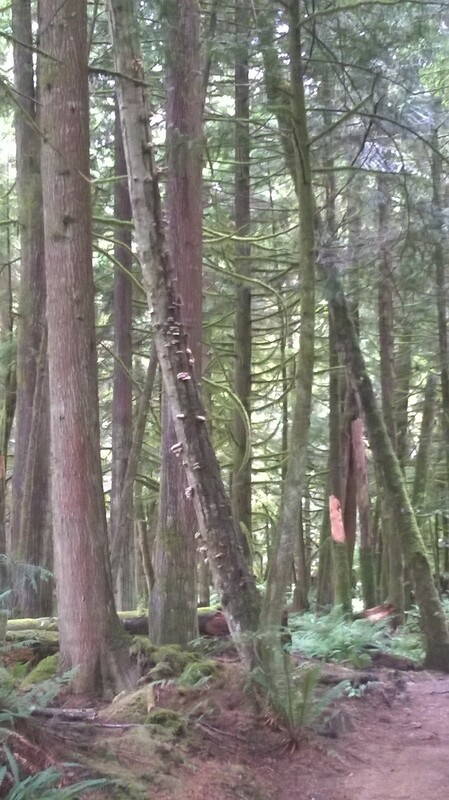 Hope to see you sometimes on the trails-coastalshroomer. Wasn’t that a great bit of rain we had this weekend? A bit of rain on Friday and then a really nice soaking on Sunday morning. The garden and our shrubs just perked right up, but the only thing was we could have used a couple of more days of that to really get down deep into the soil. Ever optimistic, I decided to take a stroll out in the woods to see how much rain made it to the fortes floor. To be totally honest, I wanted to see if there may be something from the Kingdom Fungi , other than polypores, poking their heads up. This I said to myself was a good sign. Even in the drought, give the forest floor a bit of moisture and things start to happen.. On I continued, my eyes ever scanning the forest floor to the left and to the right, to the left and the right, like one of those Cylones from that TV series Battlestar Galactica. Sure enough, I see something on my left, buff in colour, just poking up through the fir needles…I bend down closer and touch the small bump. It is firm and not a leaf. I kneel down next to it and brush away the duff and see a white stem…I lean in and give it a sniff and catch that sweet, fruity, apricot aroma. I take my knife out of it’s sheath and gently push it down beside the stem, going an inch or more below the cap and press it into the stem and slice through. I raise it slowly to my nose and sniff the freshly cut stem while also looking at the underside of the cap. No pores, no gills just folds. 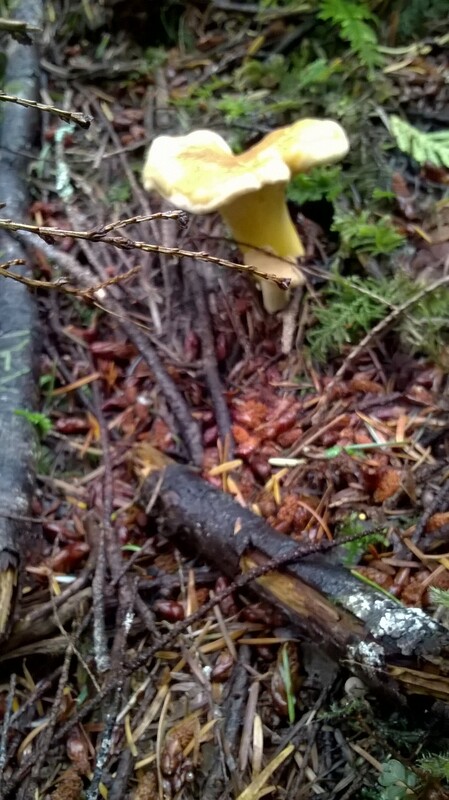 It’s my first Chanterelle of the season! Lovely! Its the earliest I have ever found some, but it wasn’t to be my last either. A bit further down the trail, I came upon a cavity where it looked like a rock had been removed or someone had excavated the area for gravel to add to the trail. I saw a while stump with a bit of a cap still attached. I crouched down and took a closer look and sure enough it was what I thought it was….a hedge hog, mostly consumed by either a slug or squirrel. On I trekked, wondering what else I would find. 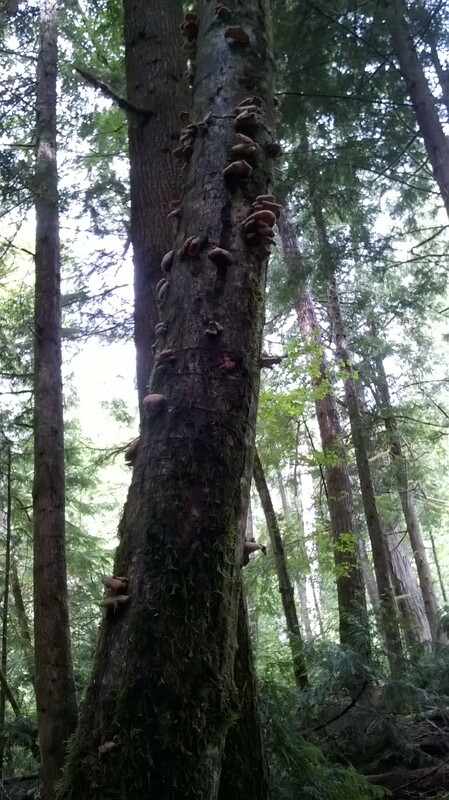 I came across more chanterells,and then a tree loaded with oyster mushrooms. Now the oyster mushrooms where a few days beyond anyone except flies and slugs. Had I been on the trail 3 or 4 days earlier I would have found them in prime condition. So there you have it….in the middle of one of the driest spring and summers on record, after one reasonably good rain and up pop the mushrooms. Oh, and for those of you who may know where I go-a-wandering, stay out of my patch!!! Yes, we are in the middle of a long hot drought…not much snow this winter, very little precipitation this spring and summer, but also not many ideas working their way onto the page from me. Maybe my ideas are tied to the rains….for example today we had a bit of rain and here I am pecking away at the laptop. Also when I look back over the last year, it seems that many of my posts spontaneously spring from my fingers like mushrooms after the rains. Could that mean that maybe I too respond to rain in the same way as the objects of my desire do? Am I a new subspecies of human…homo-fungi-sapiens? Or could it just be that when it rains, I can take a break from watering the garden, cutting the grass, pulling weeds, painting the fence or just being outside, down on the beach, enjoying the sun? What ever the reason, its good to be back here on the page, pouring out my thoughts and ideas. All joking aside, it has been a very dry year and we are at stage three water restrictions that may soon be at stage four, if we don’t get a signification rain event soon. The experts tell us we need at least 3 consecutive days of 30-40 millimeters of rain to refill the reservoir. Lets hope we get that soon. For those of you who don’t live in BC, so far this has been one the worst wildfire seasons ever with more fires reported every day.We had a fire up here just a couple of kilometers out of Sechelt that burned up 400 to 500 hectares of forest. There was also one fatality during the fire fighting. A local faller who was helping to fight the fire died when a fire weakened tree fell and crushed him. Our community was very saddened by his untimely and unfortunate death. There was a great tribute to him last weekend in Gibson, with over 800 mourners attending the celebration of his life. The fire is now out, but it was a very scary and smoky period of a couple of weeks. One Sunday morning I woke about 6 am, I was dreaming about having a smoke ( which I haven’t had in more than 15 years) and as I opened my eyes, my room was bathed in this incredible red glow It was like I was on an alien world, under a hot and oppressive red sun. 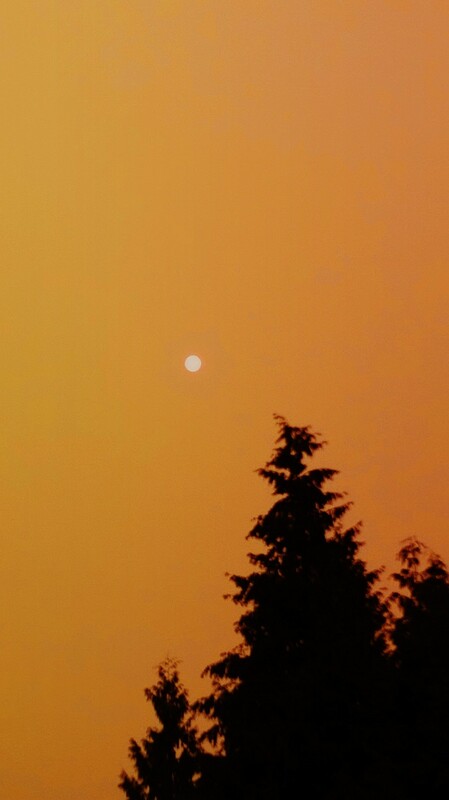 I got out of bed and looked through the blinds to an incredible red sunrise, smoke hanging low in the sky and ash drifting down like snow. Some one described it as apocalyptic. I think that was a very appropriate metaphor. On my walks in the area this summer, I have seen nary a fungal flower anywhere. It is the height of summer and usually we don’t see very much, but the trees do look dry and thirsty and some are even dying as a result of these repeated droughts. There are predictions that this will be the trend for the next several years here on the coast. Other areas of the province are getting rain, so I may need to expand my search area to interior regions. 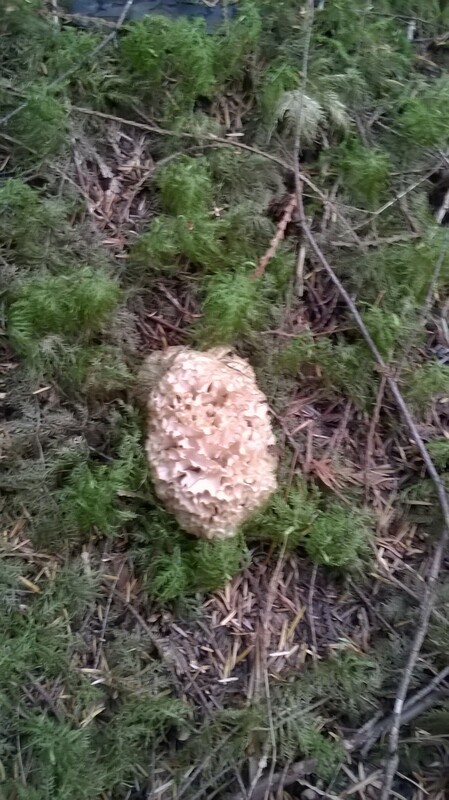 On a positive note, the burn area just west of Sechelt should have a good potential for morels next spring!. After this little bit of rain who knows what may pop up, so it’s off into the woods I go, hi ho, hi ho. 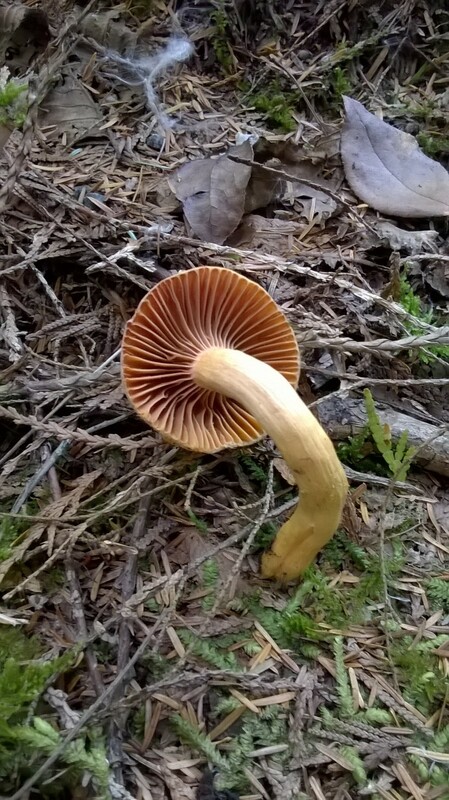 Hope to see you on the trails some time Coastal Shroomer.